In January 2012, I reviewed the then-new Zy restaurant. I won’t beat a dead horse, but I found the food at Zy to be confusing. There were more misses than hits, and some dishes simply puzzled me. Well, fast-forward two years. Zy has closed and been resurrected as an upscale Mexican-themed restaurant called Alamexo Mexican Kitchen. Much has changed with the opening of Alamexo, but not chef/owner Matthew Lake, who remains the heart of the restaurant. I very much like the new décor, especially since I was never overly fond of the cold, uninviting atmosphere of Zy. Exposed brick walls, light and dark shades of brown, contemporary Mexican folk art and well-placed bold color splashes make Alamexo easy on the eye. At the center of each wooden table is a molcajete made of lava rock—a nice touch. Those molcajetes aren’t just for show; Alamexo offers guacamole that’s made tableside and served in the stone mortars. The guacamole was good—a fresh mélange of avocado, tomato, jalapeño and (optional) cilantro—but it lacked the zing of fresh lime juice and, frankly, seemed overpriced at $10.95. Maybe we were paying for the tableside performance. I’d stick with the free housemade chips & salsa, which are excellent. A better way to begin an Alamexo meal is to order the queso fundido ($8.95). OMG, this stuff is killer! It’s Mexican cheese (queso) from Chihuahua, baked with housemade chorizo, strips of green and red peppers, white onion, cilantro (again, optional) and served with hot corn tortillas. The queso fundido comes in a small square, cast-iron skillet, and you’ll want to be sure to scrape off the slightly burnt crusty cheese that accumulates on the skillet’s sides. Other appetizers include an uninspired ceviche served with crispy fried plantain slices—a friend aptly described it as raw fish with Clamato—and chicken flautas ($7.95), which I would very much have liked to try, but our server forgot to bring them. An outstanding Alamexo starter is the tamale de elote ($9.95). This was a fresh-made tamale with seared shrimp and heavenly chipotle-cream salsa. The tamale is “deconstructed,” and served on a bed of dried cornhusk strips—a very attractive plate presentation that’s even more beautiful on the palate. The slightly sweet tamale masa is the best I’ve tasted. Maybe you’re thinking that Zy Executive Chef Matt Lake’s transition into Mexican cooking is a tad random. I did, initially. But, if you look at his vitae, it makes sense. Lake, who won a Food & Wine Best New Chef award in 1996 when he was at New Heights in Washington, D.C., also cooked at New York City’s Rosa Mexicano—which, if I remember correctly, was the Big Apple’s first upscale Mexican eatery—and at Besito in Huntington, N.Y. He also trained under Chef Mark Miller, of Coyote Cafe fame. So, in a sense, Lake has returned to his culinary roots. Before getting back to the cuisine at Alamexo, I should mention the enticing beverage options. 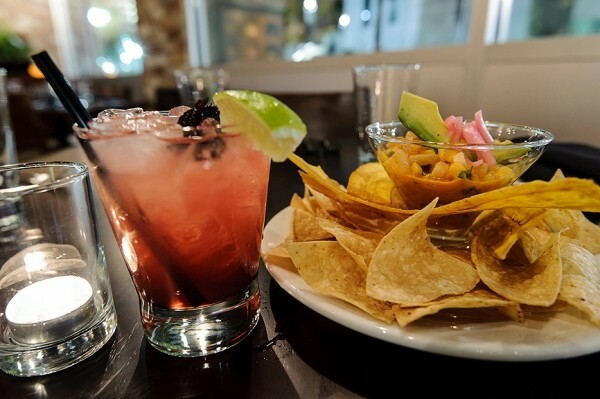 This is a full-service restaurant with a small, but entirely adequate, beer and wine selection, but it also has an extensive array of silver, reposado and añejo tequilas, and even a couple mezcals. I’d suggest trying all three of the Vida tequilas listed, or maybe a flight of the three Don Julios. There are three red and three white wines available, all from South America and Spain, and the Argentine New Age White ($8/glass; $32/bottle) is a good partner for many of the dishes. It’s a frizzante—slightly fizzy—blend of Torrontes and Sauvignon Blanc, and a little sweet, with refreshing fruit flavors. Bottled Mexican sodas round out the beverage menu. Although the prices might seem offputting for tacos ($17.95 to $19.95), they are generous servings. The tacos—chicken, pork or beef—arrive unassembled. The meats are served, like the queso fundido, on hot iron skillets, with warm tortillas, rice and beans on the side. I was able to construct four tasty tacos from my order of carne asada, and still had pieces of adobo-marinated flat-iron steak left over. I do wish my carne asada tacos had come with red chile salsa de arbol, as indicated on the menu, rather than the green salsa verde I received. The cochinita pipil tacos begin with achiote- and bitter-orange-marinated pork shoulder, which is then cooked in a banana leaf and served with habanero-pickled escabeche and yummy fried plantains. I loved the slightly sweet flavor, but found most of the pork morsels to be tough and dry. A better pork option is the mole poblano ($18.95), which is two enchiladas filled with tender pulled pork seasoned with avocado leaf, then baked in a rich, dark mole poblano sauce and topped with fresh Mexican cheese, white onion and toasted sesame seeds. I appreciate the attention given to side dishes at Alamexo: The epazote-kissed black refried beans and the white rice with garlic and toasted pumpkin seeds are excellent accompaniments to the main dishes, and the free chips for chips & salsa are always fresh and hot from the fryer. I found the one vegetarian specialty—a baked tortilla “pie” with mushrooms, squash, tomato and yellow mole ($17.95) to be, sadly, a mess—the delicious mole amarillo notwithstanding. On the other hand, a salmon filet ($22.95) with pineapple pico de gallo and mole manchamanteles—a classic Oaxacan mole—was absolutely outstanding, as was the service. I hope that with time the food flavors at Alamexo will grow to be a bit bolder, but the progression from Zy to Alamexo is off to a satisfying start.